My new computer still isn’t ready, so I continue to make do with my iPad. It is a spectacular June day in southern California. Birds are singing, a gentle breeze is blowing off the ocean, and all is right with my green world. I just finished watering the front, and am sitting on my comfy chair on the deck in back, admiring my jungle of a garden back here. That was the front yard. With luck, a photo of the back will show up below. Or several photos. And that’s what the view from the deck looks like. My tomatoes have turned the back beds into a green tangle of growth. My German Johnson has reached a height of six feet already, but has set only one marble- sized tomato. It’s going to be a race to see which ones will ripen first– Early Girls, Box Car Willie, Mortgage Lifter, Super Marzano, or Black Plum. Neither of the oxheart tomatoes have fruited yet, and Paul Robeson is lagging behind as well. The Amish Paste and Big Russian Paste tomatoes are setting like gangbusters. June is a happy time in the garden. Flowers galore on the squash, pumpkins, tomatoes and cucumbers, but nothing to pick, so I’m not up to my ears in canning jars. I think I ‘ll have another cup of coffee. 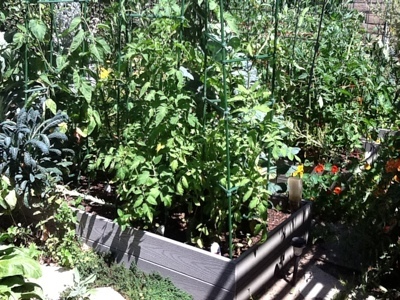 This entry was posted in Uncategorized and tagged garden, June, southern California, tomatoes, vegetables. Bookmark the permalink. Sounds like a wonderful day in your green world! I just came in to get a cup of coffee too! Robin, if you were here, I’d offer you a glass of wine. It’s that time of day. 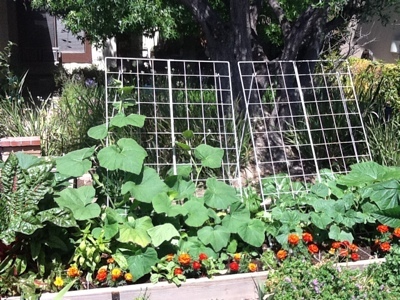 There is a lot of growth going on in your garden!!! Congratulations on your iMac!!! I learned on PC computers in college, but have used Apple computers since then for many years. I think you will find iPhoto an easy way to import, organize, and edit your photos. I just plug in my camera and iPhoto starts up and asks me what I want to import from the camera’s chip. GrafixMuse, you make it sound so easy. Why am I having so much trouble? I have iPhoto, Aperture, and Nikon software on my new computer, and tried to buy PaintShop, which I am familiar with at least, but PaintShop Pro won’t run and their tech support has gone home for the day. Bummer. Good idea to relax with a cup of coffee. 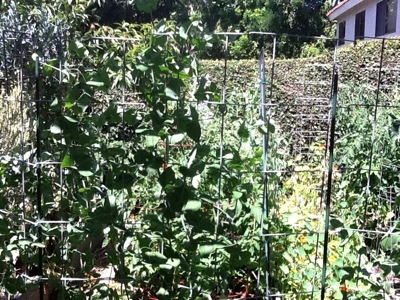 Everything is growing so well and happy in your garden. Um, coffee. Yum. But Norma, it looks like its wine time now. beautiful garden! would love to see pics of your coop. 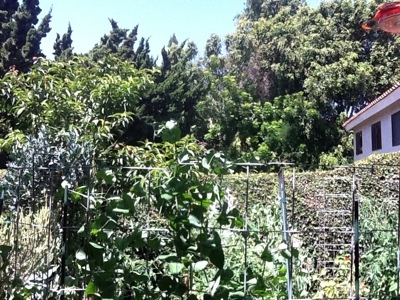 I feel overwhelemed gardening in the heat of s.ont i cant imagine growing food in sunny california!!!!!! Dirt, It isn’t hot in Huntington Beach where I live. We are three miles from the ocean, which is nature’s air conditioner. To see pics of our chicken coop, just search on my blog for coop. Or I can post some more pics as soon as I can figure out my new camera, new software, new computer, old brain.